Roasted Vegetable Panzanella - Here in North Carolina, we are finally getting teased with the idea that summer might finally be loosening its grip. 'For the first time in months, I looked at the forecast and didn't see a high in the 90's anywhere in the next seven days. 'I confess that summer is possibly my least favorite season. 'I have fair skin and sensitive eyes (even if they aren't blue), and I hate to be hot. 'With summer's end, I realized that I haven't really made a whole lot of summer food. 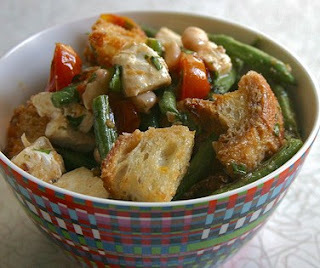 'However, the idea of a panzanella has long appealed to me. 'Last week, I realized it would probably be the last time it would really feel like summer, and I wanted to eat something that would bridge the gap between the seasons. 'What better than a roasted-vegetable panzanella? Let me be honest: I am still a midwesterner. 'So is my husband. 'When I told him what I was making, he had no idea what it was. 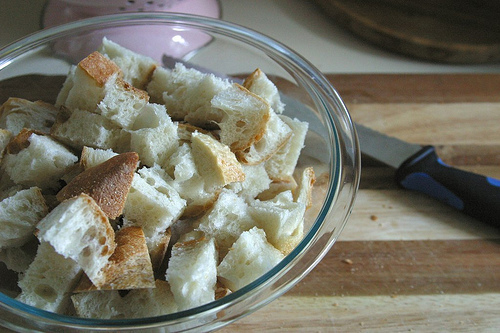 'I said, 'it's a bread salad.' 'Confused face, he went out for a burger with a friend. 'I didn't let that stop me, oh no! 'But I did wonder about whether or not this could really qualify as dinner. 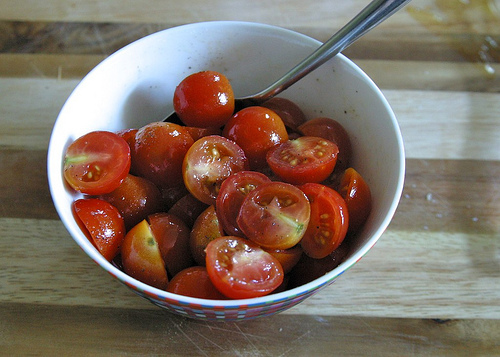 Guys, I even bought tomatoes for this recipe. Probably every time I make a recipe with tomatoes as a main ingredient, I will make a point of telling you because my aversion to fresh tomatoes is so high that it concerns people. 'Since these are roasted, I figured I'd keep them in the recipe. 'Anyway, if you still have a bit of summer left where you live, or just want to feel like you do, I recommend you make this panzanella. 'I found that it would work well as a side dish, or a main dish, depending on your level of hunger, or attitudes about what constitutes 'dinner' in your house. Arrange oven racks in upper and lower thirds of oven and preheat oven to 425'F. Mince and mash garlic to a paste with a pinch of salt using a large heavy knife, (or if you have a Microplane grater, or a garlic press, then you can get it into a paste that way) then transfer to a small bowl and add 1/4 cup olive oil in a slow stream, whisking until combined well. 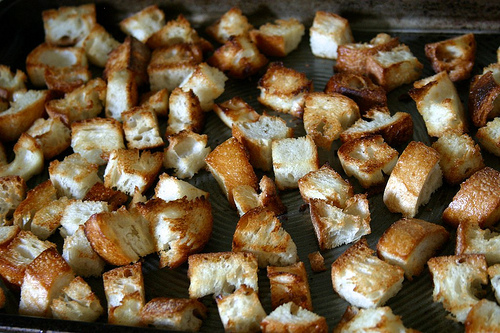 Put bread cubes in a large bowl and drizzle with 1 & 1/2 tablespoons garlic oil, tossing to combine, then divide bread between 2 large shallow baking pans, arranging in 1 layer. Toast in oven, stirring once or twice, until golden, 10 to 12 minutes. Leave oven on. 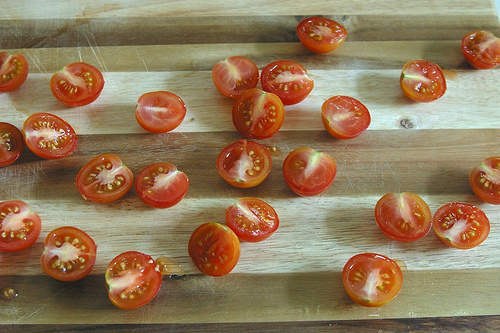 Gently toss tomatoes with 1/2-1 tablespoon oil (not garlic oil), 1/8 teaspoon salt, and 1/8 teaspoon pepper in a bowl, then arrange in 1 layer on a large shallow baking pan. Toss green beans in same bowl with remaining 1 tablespoons oil and 1/4 teaspoon salt and 1/8 teaspoon pepper, then arrange in 1 layer in another large shallow baking pan. 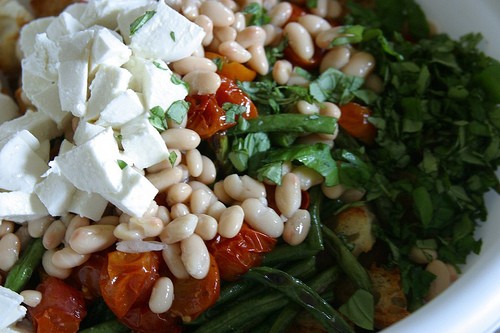 Roast vegetables, switching position of pans halfway through roasting and shaking pans once or twice, until tomatoes are very tender but not falling apart and beans are just tender and browned in spots, 10 to 12 minutes. Cool vegetables in pans until ready to assemble salad. 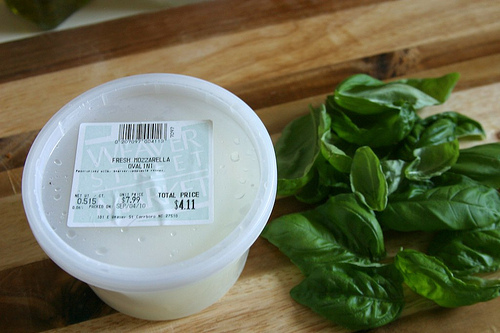 While vegetables roast, add vinegar to remaining garlic oil along with capers, sugar, 1/4 teaspoon salt, and 1/8 teaspoon pepper and whisk to combine well.